Readers, I've completed the adjustments to my muslin. It's not pretty, but at least I have the satisfaction of knowing that what I thought would work ... will! I added an additional 1/2" to each side of the neck opening as planned. Gone is the gap between the edge of my shirt collar and the neckline of the jacket. Hooray! I also raised the back neckline 1/2" as well. Thanks to Mrs. C for suggesting that I "dart out" the gap that made the jacket pull away from my chest. This looks so much better. A side benefit to making this adjustment is that now the jacket wants to hang closed. In this picture I don't have the jacket pinned closed. Before, the bottom of the jacket wanted to swing out when not buttoned. Side view of the male bust adjustment! If you gals can have FBA's and SBA's I guess we guys can have the MBA! I figured the dart to be about 3/8". After establishing its position in relationship to the other front dart, I marked it on my Swedish tracing paper and folded the dart out. Easy. Here you also see where I've added 1/2" to the neckline. 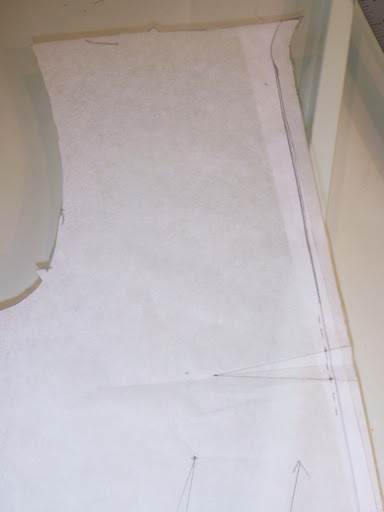 I simply tape on a scrap of paper and redraw the line. The Swedish tracing paper makes this a snap. Love the stuff! 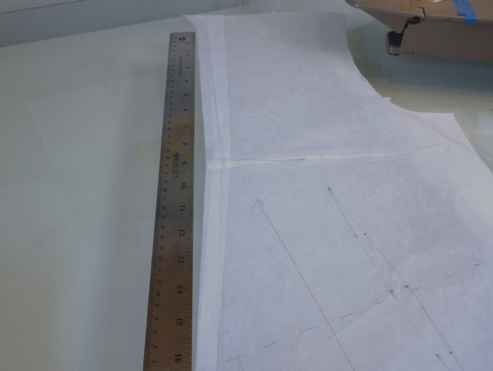 To make the pattern lay flat I had to extend the dart quite far across the front. Hopefuly, this will keep the effect I'm after. New territory here. This picture also shows the new neckline, which is now ever so slightly curved rather than straight. 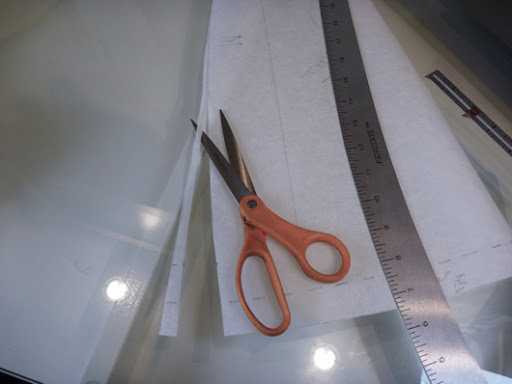 Lastly, I trimmed 3/8" from the front / side seam, tapering up to the waistline. 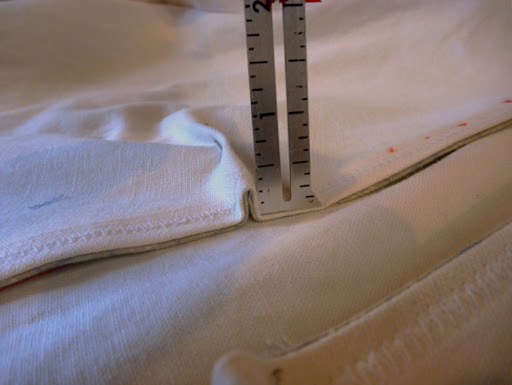 This has helped reduce the fullness at the hem without causing the back vents to pull open. I could have perhaps taken out more, but I've learned that most times a little adjustment is better than a huge one. Ripping apart muslins and fudging them back together is hardly my favorite thing to do. I'll be very glad to put this step behind me. My fabric is prewashed, so it's time to cut this jacket out. I must use that in casual conversation. I too dislike ripping apart/piecing a muslin. But I keep reminding myself, that's why I made it. Love the fit. This looks awesome. I like the fit much more than your original Muslin. I can't wait to see the finished product. Part of me is hoping that your fabric is white or nearly white as I think that it would fit the style (lapel-less) well. Also, as the spring and summer are approaching, I'm itching to start cycling some of my brighter colors back into my wardrobe! This looks like a great fit. Looking forward to seeing the final garment, nice work. Cool! That slight curve is the shoulder coming in a little closer at the top as the top part of the jacket absorbs the rotate from the dart. This is a good thing as it is where there are sometimes problems, like the neckline not being close enough to the collar. The adjust get will support your addition there, I feel :) And the curve will appear straight - a straight line in a 'break' like that generally appears convex. This is so exciting, vicarious menswear tailoring, heaven! great fit. looks like you are making excellent progress! I am thoroughly enjoying your process - anxious to see the final jacket. And of course your changes will make you look taller....and younger....and smarter....and who-knows-what else! It will be a life-changing jacket! I am a bit confused how this will affect the lapel. Nice fit though. Never made a jacket before. Can't wait to see the final product. Great blog and great ideas. Wow this is interesting! I didn't know that darting the neckline like that will get the jacket to "want" to stay closed, I always have issues with that! I'm definitely going to try and apply this to the next jacket I make.